Looking for delicious southern dishes to make this fall? 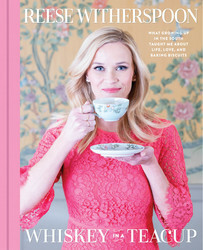 Reese Witherspoon, who grew up in Tennessee, reveals some of her favorite recipes, traditions, and advice in her gorgeous new book, WHISKEY IN A TEACUP, and we’re thrilled to share one of those recipes with you today. Reese’s southern upbringing informs her whole life, and she loves sharing the joys of southern living with practically everyone she meets. 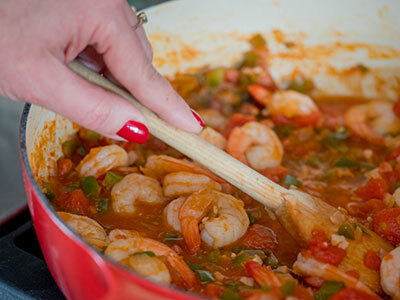 Here, Reese dishes up her personal recipe for Shrimp and Grits, perfect for anyone looking to add a bit of classic southern flair to their cooking. The combination of creamy grits with slightly spicy, tomatoey shrimp is a classic coastal dish in the South. It’s comforting and hearty, but in an elegant serving bowl it can also be a perfect meal to serve at a dinner party. In a medium saucepan, bring 3 cups of water to a boil over high heat and stir in the grits and salt. Bring back to a boil, stirring occasionally, then reduce the heat to low, stir in the butter, and simmer for about 15 minutes. The grits will absorb all the water, so you will need to stir them occasionally, and you can add more water if they become too thick. The grits are easy to keep warm on very low heat, just adding water when needed, but you must stir them every now and then to keep them from sticking to the bottom or clumping. In a large skillet or sauté pan, combine the olive oil and butter over medium-high heat until the butter is melted. Add the onion and green pepper and sauté until they begin to soften, about 4 minutes. Add the garlic and cook for 1 more minute. Stir in the tomatoes and their liquid, the Cajun seasoning, and the tomato paste. Cook for 2 to 3 minutes and add the shrimp, stirring for about 2 minutes, until the shrimp turn pink. Add the water and Worcestershire sauce and cook for another 2 to 3 minutes until heated through but not boiling. Taste for seasoning, and add salt if needed. Serve immediately over the warm grits and garnish with chopped green onions. For more delicious recipes, check out WHISKEY IN A TEACUP by Reese Witherspoon. Excerpted from Whiskey in a Teacup by Reese Witherspoon. Copyright © 2018 by the author. Used by permission of the publisher. All rights reserved.